I believe we could track the decline of human civilization by simply watching the number of pallet companies being destroyed by fires. The number per unit of time (weekly, monthly, whatever) will increase, eventually peak, then decline as there will be a decreasing number of pallet companies LEFT to burn. By the time there are no pallet companies left at all - and hence no pallet company fires - there will probably be little or nothing left of human civilization at that point either. In other words, we could use pallet companies as a model for the state of human civilization itself. Quote: "A total of four buildings were lost in the fire, including the main lodge, kitchen and dining room, 200-seat conference centre and guest rooms." Quote: "Darrell Haynes says he had just finished cutting the grass, and parked the mower in the garage, where he heard the booms." Quote: "I was in the garden and there was a big [explosion] sound like something had blown up." 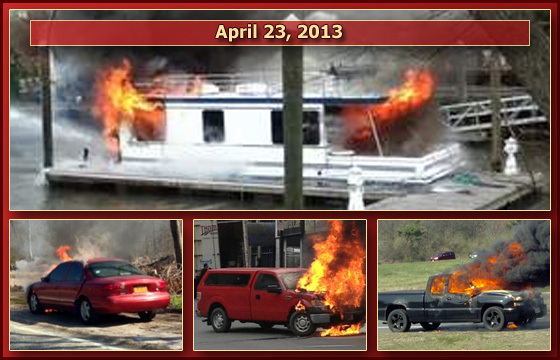 Quote: "It was the second vehicle fire of its type in the street in a week." Quote: "A manager said the fire started in a ventilation system and spread to the roof." Note: Hydrogen sulfide and/or methane are being absorbed into flammable absorbent materials and spontaneously combusting. Many such materials will be found at landfills and recycling centers, such as wood, paper, cardboard, generic trash, clothing, cotton, wool, hay, straw, carpet, dried brush, etc. Quote: "I had gone to bed, but was not asleep, and heard some popping sounds and just went to check it out," said Harris. "That's what we heard from the other fires also." Quote: "I've never heard anything like this. And most of the people that have been involved with this, they've never heard of anything like this, either." Quote: "...it was suspected that they had gone in search for food and fallen into the ditch." Quote: "Kate Malonyay was found dead with bruising on her body on Monday when officers forced their way into her ground-floor Mosman apartment. The Homicide Squad is treating the death as a suspected murder but say an autopsy yesterday was inconclusive." Quote: "...one of the tires on the aircraft did blow out, forcing personnel to shut the runway down for a bit..."
Quote: "Police said Wednesday that the driver of van that flipped on I-264 and caught fire Tuesday night will not be charged because he had a medical condition." After learning this info I now understand the H2S ELE process better. Is there any way that you could print this separately in the FAQ or even better include it at the beginning of each event? A new model for mass extinctions at the end of the Permian period 251 million years ago and the end Triassic 50 million years later explains how intense global warming could trigger deaths in the sea and on land. that releases enormous volumes of carbon dioxide and methane. (2) The gases cause rapid global warming. (3) A warmer ocean absorbs less oxygen from the atmosphere. (4) Low oxygen (anoxia) destabilizes the chemocline, where oxygenated water meets water permeated with hydrogen sulfi de (H2S) generated by bottom-dwelling anaerobic bacteria. (5) As H2S concentrations build and oxygen falls, the chemocline rises abruptly to the ocean surface. which consume H2S and normally live at chemocline depth, now inhabit the H2S-rich surface waters while oxygen-breathing ocean life suffocates. (7) H2S also diffuses into the air, killing animals and plants on land (8) and rising to the troposphere to attack the planet’s ozone layer. I have that document linked in both the full hypothesis (Hypothesis top menu selection) and in the Info Links section at the top too. But sure, I will add that portion to the FAQ too. That document is one of the things that my 'danger sense' locked onto a few years ago, and I asked myself, 'Could this be happening again, RIGHT NOW?' And the more I looked, the more it looked like it was happening. At this point I am sure of it. Everything you'd expect to see is present and nothing is missing that you would expect to see. Those scientists didn't have the latest science available to them when they wrote that, however, and they got a few things wrong. For instance, what kicks off the volcanic eruptions in the first place? I've explained that in the newly rewritten Jumping Jack Flash Hypothesis, and it starts with the Earth's ice melting. And obviously, when those scientists wrote that document, they never seriously considered that this could be happening NOW, so they left out ALL KINDS of important details that affect OUR lives, like the copper reactivity problem, the rusty iron/steel reactivity problem, the problem with biogenic sulfide corrosion eating away at steel and concrete, the neurological damage hydrogen sulfide causes in humans and animals, and most of all THE FIRES AND EXPLOSIONS. That's a lot of stuff to leave out! The UV is already escalating too, and they have that at Step 9. That's another thing they didn't mention - that we'll see multiple steps simultaneously, and Step 8 need not be complete before we see Step 9, and Step 7 need not be complete before we see some of Step 8, and so on. Overall though, that was one great and informative piece of science there, and I never would have figured out all that I have without that document to help my danger sense begin to lock on to the H2S danger. I should have added that I got the H2S ELE info from your link. The 'New & Improved' JJF Hypothesis also helps explain things better. It's reassuring to know some people take the time to look at the links! I figured you got the link here - I don't really see anyone else talking about this, and I'll tell you, that alone just blows my mind. Maybe I don't use enough OMGs and WTFs, but then, I'm just not that kind of person, and I don't want to be alarmist anyway. But jeez, it's about time to wake up! They do talk about it at Arctic-News & some other sites but overall these types of sites are very limited with scholarly type talk (usually) which turns the average person off. For me, the increasing radical Earth changes that have been happening over the last few years have been impossible to ignore so I naturally started to do research because I wanted to find out what was cause. Fukushima was the catalyst that got me researching but as immensely serious as that is (it is a smaller scale ELE) it dwarfs in comparison to an ELE that could affect the entire planet. You would think that by now every intelligent & sane person would be doing research. A scary thought is that maybe every intelligent & sane person is already doing Earth Change research but because of decades of being 'dumbed down' that is only a small percentage of the population! Unfortunately 'Idiocracy' has been prevalent for quite some time. "How does it feel to be the greatest guitarist in the world? I don’t know, go ask Rory Gallagher." Not so impossible to ignore for some, due to 'Idiocracy Syndrome'. Heh, plenty of people are STILL ignoring what's going on! LMAO, yep, I'd heard that quote. Too bad we lost Jimi so young. He was a mountain of awesome. Also, yes, some websites are so focused on science that they completely exclude the human factor, digging down into the nitty gritty of what the absorption rates of methane are in water with a variance of 1 degree Celsius, with charts and graphs, blah blah blah. Nothing wrong with that, but you're totally right that it turns off the common man, because there's no way to relate that to your own life. Me, I'm not a scientist. That doesn't mean I don't like science or understand science nor does it mean I lack any education in science. But I'm more common-man-oriented, like, how does this affect PEOPLE, how does it threaten LIVES. I like humanity with a generous dollop of science, instead of pure science with a tiny sprinkling - if any at all - of humanity. So I try to show a lot of the human element in the stories that I find, because I know people can relate to that. That's more real to people than any scientific charts describing absorption rates or temperature variances and the like, because it is not difficult to picture yourself in many of these stories. Another very tragic event that joins the long list of them. It may have been caused by gases but we'll never know. The overturned canoe was found along with their belongings. "Note: They'll probably eventually find their empty 'ghost boat' canoe and then the corpses.."
"Search and rescue started looking for the pair Sunday night. At daylight Monday, an RCMP helicopter flew over and found the overturned canoe. Found in the water were two ball caps, several items of clothing and equipment belonging to the boys, who drove up to the family recreational trailer at Nicola Bay Resort for the weekend."